How can I begin to describe something so ridiculous? I guess I’ll call it an experiment in nostalgia. But you can’t be nostalgic without the present as a point of reference. So consider me, a recent graduate of a liberal arts college, desperate to analyze whatever I can get my hands on and without a paper or discussion session in sight. Enter Sweet Valley...but I guess there’s a little more to it than that. For a girl whom the stars have fated to be literary, I got kind of a late start with "literature." Right up until my teens, I really preferred the sort of girl-pulp genre that included such classics as The Girl With Green Hair and a series based on the Girl Talk board game. 10 years later, I'm a pretty voracious reader, but my near-forgotten love of the preteen genre flooded back with a vengeance one day when, before a long train ride, I found a copy of Sweet Valley High #10, The Wrong Kind of Girl in the giveaway box outside of Powell's Books in Hyde Park (Chicago). I couldn't resist; I read the book from front to back in the next 2 hours. It was unbelievable. Literally. To summarize: A slutty girl who's ostracized from becoming a cheerleader (despite her gymnastic prowess) overdoses on pills and can only be coaxed out of the ensuing coma by a tearful apology from Jessica Wakefield and the presentation of her very own SVHS cheerleader's uniform. Have you ever heard anything, ANYTHING less believable? Or more awesome? I was totally rapt by the pureness of the high school stereotype: hunky football players, studious newspaper writers, scrawny dorks with no girl skills...this was like the mold that Saved by the Bell was cut from. I began to read more of the books, and got the insane idea of actually collecting them, starting with Book 1, and I found that the stereotype—or was it an archetype?—held fast. I wanted to tell the world! But all I had was my roommates, who were eager enough to hear my recaps, but not terribly interested in actually reading the books. 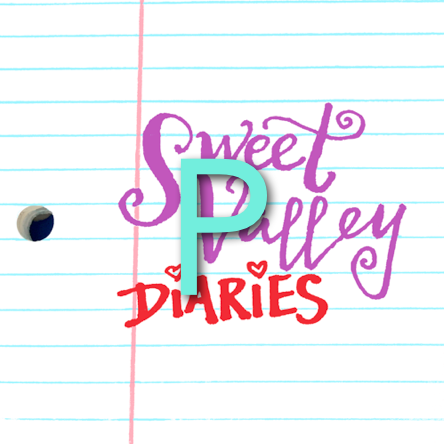 From this periodic practice, The Sweet Valley Diaries was born. Of course, my collection continues to grow, so that The Diaries can. Somewhat eerily, my local library got rid of their whole Sweet Valley High collection about a month after I started my project. The books from the original series are out-of-print, so I typically get them for about a dollar each on Amazon or eBay. God bless the internet. Not only did it bring my long lost books to me, but it has brought me to you! May it divert you sufficiently. Amen.